As mentioned on previous post, there was just something about hearing Bono sing -- with Larry, Adam and The Edge playing -- "The Unforgettable Fire" live at last night's U2 360 Tour performance at the Georgia Dome in Atlanta. I also lamented about leaving my Flip Camera at home just when it was needed the most. 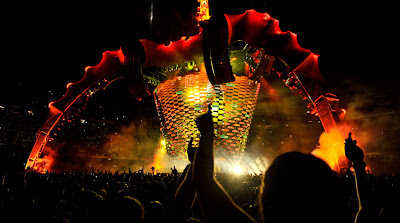 Fortunately, this evening my online searches led me to a YouTube video from the U2 360 concert in Barcelona. 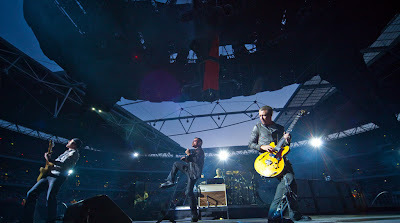 Had my Flip been on me yesterday evening, this is what the Georgia Dome U2 video would resemble (the presumably Spanish camera operator was standing in about the same stage left section as my location in Atlanta ... but I was even closer). What Will You Do In The Next 1,000 Days? Avatar, Sigourney, Gorillas -- AWESOME! Jesse Jackson, Can I Get An Amen?